Running the dairy is truly a family affair for the Berettas, with five generations actively involved on the farm and in supporting the local agriculture community. 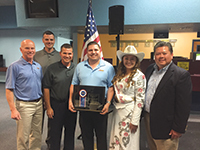 The Sonoma County Fair Board of Directors is proud to recognize the Beretta Family Dairy as the North Bay’s 2018 Dairy of the Year. In 1948 Doug Beretta’s grandfather bought a ranch on Llano Road and started what would become Dairy of the Year in 1998. The dairy was an early adopter of environmentally friendly practices and has continued to champion management practices in regards to water quality, nutrient and pasture management. In 2007, Doug and his father transitioned the dairy to an organic operation. The decision was an easy one as many of the requirements were already implemented into their current management practices. In 2010, Doug purchased the dairy from his father and continues to run it with the help of his wife Sharon, their three children Jennifer, Lisa and Ryan, and what will be the 5th generation on the Beretta dairy, his 7 year old grandson Braydon. Doug said he always envisioned running the dairy someday with the help of his entire family. Today, Sharon and their children all have significant roles on the ranch. While Doug knows it is important for him to oversee all aspects of the ranch, he and his oldest daughter Jennifer share an appreciation specifically for the cow herd, while his son Ryan focuses on farming and ranch operations. Sharon not only still handles the books, but she spends an equal amount of time with their other daughter Lisa taking care of calves at the Dolcini Jersey Dairy. While everyone has their specialty, the whole family is well versed on all aspects of the dairy. He explained that at times, Ryan will help with the cows, and Jennifer has clocked several hours on a tractor. With such an important emphasis on a family run dairy, Doug’s future goals are to continue working hard with Sonoma County agriculture, environmental requirements, and open space concerns, to make the necessary fluctuations and ensure this 400 acre dairy will continue to fit into the community. Outside of the dairy, Doug has been a Board Member of the Sonoma County Fair for the last 10 years, chairmen of a resource management group, and past President and Board Member of the Sonoma County Farm Bureau since 1996. Doug feels it is important to dedicate the time to organizations such as these to safeguard the future of agriculture in Sonoma County. After a push from his grandmother to join Farm Bureau, he realized there is a ongoing need to keep ranchers influence resilient when it comes to future innovations in agriculture without giving up some of the traditions. The Sonoma County Fair is pleased to dedicate the 2018 Hall of Flowers to JR Abueg. JR began his association with the Sonoma County Fair Flower Show in the late 1980's when he began participating as an Amateur Garden Exhibitor. From there JR transitioned to working part-time as a seasonal employee, eventually becoming the Building Supervisor for the Hall of Flowers and finally the Supervisor for all the Still Exhibit buildings. 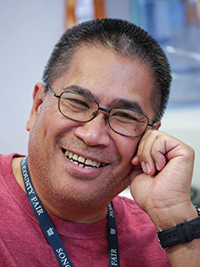 Though there were many things JR found rewarding about his work at the Fair, he enjoyed being able to provide as much physical and emotional support as possible to the Junior and Adult Exhibitors. He loves seeing the big smiles on their faces as they crafted their garden designs. JR’s dedication and positive attitude is noticed and admired by all around him. The Sonoma County Fair Board and staff are honored to thank him for his years of service and dedicate the 2018 Hall of Flowers to Romeo “JR” Abueg in recognition for his long-standing commitment to the Fair and its exhibitors. The Sonoma County Fair Board and members of the local ranching industry are honored to have selected Jerry Norman as the 2018 Outstanding North Bay Rancher and the recipient of the J.W. Jamison Perpetual Trophy. Jerry has always had a love for cattle and working outdoors. Growing up in Humboldt County, he helped his step father run auction yards in Fortuna and Ukiah. Needless to say the cattle business became second nature to him. A few years after graduating high school, he moved to Sonoma County. Running one of largest herds of commercial cattle in Sonoma County, Jerry focuses on raising cattle that are productive in his herd, while at the same time desirable for today’s market. He believes it’s important to be able to change with beef industry standards as well as all aspects in agriculture. Jerry feels it is important to use his land efficiently and has recently started housing his cattle further north in the winter time, giving his pastures in Sonoma County plenty of rest and therefore maximizing his feed availability and efficiency year round. He has tried diverse ways to market his cattle including, selling cattle by video, however, his preference is to sell direct to a buyer. Jerry has always made a living in the cattle business and doesn’t see that ever changing. He will continue to take time if needed to drive truck or haul cattle, but his main focus will continue to be on his commercial herd. When the sale season is busy, he still helps his family in Humboldt County at the family owned auction yard. 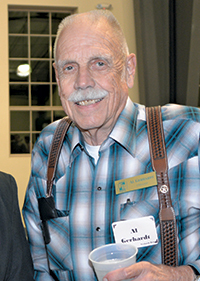 Jerry also supports the Sonoma County Fair serving on the beef advisory committee and is a long time member and Past President of the Cattlemen’s Association. For over 40 years Buzz and Cookie Buzzini have continued to pass on their all-encompassing knowledge and wisdom in the riding and rodeo industry. With extensive backgrounds in the horse industry and a combined passion for providing a place for kids to ride and learn, the Buzzini’s are helping to form and maintain the vibrant horse community enjoyed in Sonoma County. The Sonoma County Fair Board of Directors is pleased to present the 2018 Award of Excellence in the Horse Industry to Buzz and Cookie Buzzini. Both of them grew up in California, and miles apart in very unassuming neighborhoods. Buzz grew up the third generation in his family to take an interest in horses and rodeo. During the day, those on the rodeo circuit had day jobs in downtown San Francisco in what Buzz remembers as “butcher town”. The district in the Bayview sector of San Francisco, was an industrial community of butcher shops, tanneries, wool pulleries, tallow works, all supported by the barge and railway system for transportation of goods. Every day after school Buzz would join his uncle and the rest of the rodeo circuit leaving their day shift in butcher town and practice his riding and roping at McLaren Park, where shows and rodeos were hosted. He also worked for his uncle who cared for an arena and stables over in Daly City in exchange for time in the arena to practice. At the same time in Burbank California, at the Beverly Hills Stables, Cookie was 7 years old and following in the footsteps of her mother. Her mother was an avid English rider. Cookie said when her mother purchased her first horse for her, she decided to head in a different direction, and taught herself to ride western instead. Today, Buzz and Cookie are enjoying retirement from rodeo and horse shows, and now run beef cattle at their ranch. 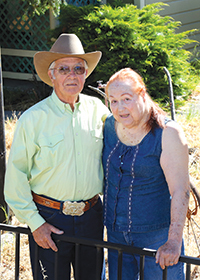 Buzz still offers lessons and they are members of the California Horseman Association, American Cowboy Team Roping Association, the Novato and Petaluma Riding and Driving Club and are lifetime members of the Sebastopol Wranglers.